What we should make of the 2014 Cincinnati Reds? With 60 percent of the regular season games in the scorebook, it’s a good time to assess the team and look for insight about the year. If you’re in search for an easy narrative about a player, there’s a clubhouse full of them. Johnny Cueto can twist without shouting in pain and have a career year at the same time. Billy Hamilton has defied expectations and the laws of nature. Devin Mesoraco has landed in the baseball world like the Incredible Hulk. The league of extraordinary gentlemen known as the best players in baseball now has Super Todd Frazier as a member. Closer Aroldis Chapman is striking out more than half theÃ‚Â batters he faces, after being hit squarely on the head by a line drive in Spring Training. Those are a few of the compelling story lines about individual Reds players. As a team, the Reds are 51-44. They are 1.5 games out of first place with 67 to go. But it would be deeply misguided to evaluate this team by the performances of individual players or the most recent standings. The Cincinnati Reds’ most impressive accomplishment has been a single, yet incredibly difficult, feat. They got up off the mat. And considering the extreme challenges theyÃ¢â‚¬â„¢ve faced this year, thatÃ¢â‚¬â„¢s an improbable and spectacular triumph. The injury list reads like the Spring Training role call. The Reds have played weeks without Jay Bruce, Mat Latos, Joey Votto, Aroldis Chapman, Devin Mesoraco (twice), Jonathan Broxton, Tony Cingrani and Skip Schumaker (twice). TheyÃ¢â‚¬â„¢ve had Billy Hamilton, Brandon Phillips and Homer Bailey at less than full strength at times. I’m surely forgetting a few. You eventually get numb to it. Magnifying the impact of these injuries was a filament-thin roster, the product of a stunningly ineffective off-season by general manager Walt Jocketty. 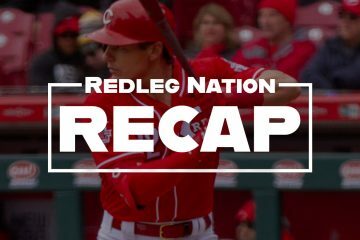 The Reds started the season without a backup first or third baseman and no real depth in the middle infield or outfield at the minor league level. The spot starting pitchers have at various times been Jeff Francis and David Holmberg. Misfortune and obstacles of this magnitude can end seasons. Ask Tampa Bay, Colorado and Texas, who are 9, 15 and 19 games below .500. Ask those teams if the cumulative effect of injuries can be lethal. Yet the Reds stride into the All-Star break with a winning record. Again, what do we make of that? ItÃ¢â‚¬â„¢s been said that adversity lets us judge true character, it tears off the mask so that only reality remains. If that’s the case, the Cincinnati Reds’ true nature is resilience and determination. The 2014 Reds have been declared toÃ‚Â be stone dead in a momentÃ‚Â countless times. On May 27, the Reds were six games below .500. They beat Clayton Kershaw the next day. On June 10, the Reds were five games below .500. They beat the surging Dodgers twice. On June 20, the Reds blew an 8-run lead and found themselves 8.5 games out of first place. They won eight of the next nine games. On July 2, the Reds were swept by the San Diego Padres to fall to seven games out of first place. They won six of seven. The men in the Reds’ locker room have stubbornly refused to call it quits. They’ve shown with their mid-summer run, with their three 4-run comebacks this week, that in the face of roster devastation, they havenÃ¢â‚¬â„¢t let doubt or discouragement creep into their minds as it did for segments of the fan base. That reflects a clubhouse with strong character. And I give a healthy share of credit for that to their first-year manager, who has held this team together. The season hadnÃ¢â‚¬â„¢t even started when Bryan Price’s mission statement suddenly changed from winning the NL Central to outright survival. Price has had to cope and improvise and adapt beyond all reasonable expectation. As outsiders, we donÃ¢â‚¬â„¢t know what goes behind the closed doors the locker room. We base our opinions on inference from glimpses allowed by press conferences and interviews. From all the available evidence, Bryan Price has provided valuable leadership. HeÃ¢â‚¬â„¢s exhibited a thoughtful and calm, but ferocious, presence. HeÃ¢â‚¬â„¢s expressed furor at umpires, determination toward opponents and frustration at his own playersÃ¢â‚¬â„¢ performance. Complacency and comfort have left the building. And donÃ¢â‚¬â„¢t make the mistake of underestimating the role of the head coach or manager. While there are certainly other leaders in that locker room, the boss is watched closely by the players. More than any other person in that private space, his bearing has an impact on the men who follow him onto the field. Price has been resilient and kept his team moving forward against setbacks. Of course, Bryan Price isnÃ¢â‚¬â„¢t perfect. No manager (or human) is. Every skipper makes in-game decisions that fans question. ThatÃ¢â‚¬â„¢s an inherent part of making dozens of close calls each game. Despite the open-mindedness Price has shown on his lineup at times, heÃ¢â‚¬â„¢s still batting some players too high and some too low. He pays too much attention to previous match-ups. Of course we fans have complaints. ThatÃ¢â‚¬â„¢s baseball. But our gripes are also mostly about window dressing. Managers donÃ¢â‚¬â„¢t affect many outcomes with their decisions or lineups Ã¢â‚¬â€œ itÃ¢â‚¬â„¢s only at the margins and only occasionally. Those margins are still worth discussing and they can be important. But any time you can point to the manager making a mistake, you can also identify dozens made by the players in that game. The managerÃ¢â‚¬â„¢s main role is personnel management through communication and leadership. It’s more than walking down the street together in tight blue jeans and leather jackets. David Foster Wallace wrote: Ã¢â‚¬Å“Real leaders are people who help us overcome the limitations of our own individual laziness and selfishness and weakness and fear and get us to do better, harder things than we can get ourselves to do on our own.Ã¢â‚¬Â The Reds’ collective success would indicate Price has excelled in this way. As for the rest of the baseball organization, itÃ¢â‚¬â„¢s (past) time for Walt Jocketty to do his job Ã¢â‚¬â€œ and do it well. Jocketty needs to patch the roster holes and also keep up with the competition who will be taking steps forward. To be clear, Walt Jocketty doesnÃ¢â‚¬â„¢t have to come up with an amazing, unforeseen trade acquisition. He doesn’t have to land Giancarlo Stanton. Jocketty just needs to do what effective GMs do when their team needs a player. They get one. When the Cardinals need a shortstop who can hit, John Mozeliak gets one. When the Tigers need a closer, Dave Dombrowski gets Joe Nathan. Walt Jocketty has done this many times before, both in Cincinnati and St. Louis. But Jocketty failed at that exact task at last yearÃ¢â‚¬â„¢s trade deadline and during the most recent off-season. If he fumbles again in the next two weeks, itÃ¢â‚¬â„¢s hard to see the Reds competing for the post-season. Friday nightÃ¢â‚¬â„¢s comeback may have been thrilling, but it was absurdly improbable. Decide for yourself how many times you want to rely on Ryan Ludwick, Chris Heisey, Ramon Santiago and Brayan Pena to get back-to-back-to-back-to-back hits to win a game. Or depend on Kris Negron to hit a three-run homer. The Reds aren’t through facing hardship. In fact, the next few weeks may be the most challenging. The team is staring down the abyss of doing without Phillips and Votto for weeks, if not months. But we should have learned not to underestimate that group of men in the Reds clubhouse. They have shown to be capable of surprise, of thrills, of success against the odds. Vince Lombardi said real glory is being knocked to your knees, getting up and then coming back. If the 2014 Cincinnati Reds continue to persevere and defy adversity, the next few months will indeed be a glorious season for them and their fans. Game 95: Hang with us. We’re coming. This is one article that I can say I squarely agree with you 100%. Go Reds! Beautifully written. Bring on the second half! Never thought I’d see a DFW quote on this site. It’s an interesting question about where this team would be if it had only a somewhat reasonable number of injuries. If they had been fully healthy they could have already run away with the division. But on the other hand, this adversity has made marginal bench players step up countless times and that can only help the team’s long term prospects. Assuming a relatively healthy September roster, we’ll have battle tested backups and bench players all over the field. Suddenly I’m not (as) nervous about seeing guys named Pena and Santiago get starts. That could come up huge in September and hopefully October. I think DFW would have appreciated the proximity to Survivor. Good recap be sure to compare this to what you write in October. For the rest of us poor peasants here is David Foster Wallace’s obituary in the New York Times. The Reds in the second half, don’t let the devil know you are there. If Jocketty does nothing before July 31, the devil found them. Terrific article Steve. You summed up the incredible character and resiliency this team has showed. The last month of Reds baseball has been one of the most exciting and exhilarating months that I can ever remember. I agree with all but the criticism of Jocketty, which seems to be a regular mode of conversation here. Who are the guys that are stepping up right now and where did they come from? Jocketty acquired Pena, Jumbo, Skip, Santiago, and brought people up from the minors when needed. This is his job. ,Sure, they are outperforming their WAR numbers, but it is working so maybe Jocketty knows winners and bench guys that can fill in. Maybe he knows what he is doing. That said, I think that a move will be made and if it is not I will be satisfied that he knows more about it than I do. +1 . But I understand where the criticism comes from. We look and we this this trade and that trade that looks good to us at least on paper but we don’t know what restrictions that Walt is dealing with. I read online somewhere sorry I don’t have the link but the Reds were deadlocked by ownership at no more than $113 million for 2014. If that is the case we have zero dollars to go towards any contract so a trade of any type would have to be one in which in the very least we break even. I think that is why Jocketty is in the position that he is in. One thing that I don’t understand not in the least bit is how he is managing the 40 man roster. There must be more to it than meets the eye because looking at our 40 man roster leaves me scratching my head all of the time. What about Negron? where did that lightening in the bottle come from? I wonder if he can do that again after the all star break. Interesting that neither Lutz or Soto have started a single game since they have been called up. I would love to know the reasoning there to be sure. Any ninkompoop GM could have made those moves. The moves that put the Reds over the top and in a World Series are the ones that Jocketty either cannot, or will not make. His inactivity last July, over the winter and again this year speak volumes to Jocketty’s ineffectiveness as a top GM. In today’s baseball, Jocketty is a relic. A fossil. Under Jocketty’s watch, the Reds have under-achieved in 2011, 2012, and 2013. Do we want to add 2014 to the list? All that I know is this squad is 1-1/2 game out of first place at the ASB with a banged up roster, without their best player, without their GG 2nd baseman etc. Keep in my mind who hired Bryan Price. This is looking like an inspired selection. Until we know what budgetary restraints, if any, Walt is working under; I’m cutting him slack. From what I do know to be a fact, I’m giving him an A. Same as Price. Walt was also taken to task as he left St. Louis for depleting the minor league system in trades to acquire MLB talent. Walt has given up a lot in trades for Latos, Choo, and Marshall and I don’t think he wants to move many more prospects. He felt those prospects were expendable as they were pretty much all blocked at the MLB level. I think he’s at a point now where he doesn’t want to give up the farm for a player and he doesn’t want to give up much of anything at all unless a potential player he brings in has long-term possibilities with the club. Your are making assumptions with little to no real information. You have no idea what Walt tried to do and either couldn’t do to budget issues or via what was wanted in return. Instead of blaming Walt, how about Bob, I mean if he “really” wanted to win then let Walt get some players and spend some of those millions you have. Here’s what the reds have gotten out of first base for the past two weeks. .222/.255/.289 with 0 home runs. That’s not shortstop or catcher where good hitters are hard to find. That’s first base where just about any major league or aaa player could play. That’s the easiest position in baseball to find a hitter at. Now some of that has been good players playing out of position that haven’t had good games, like bruce and Frazier. But a lot of it has been that price has had to start his backup catcher at first base. And when he does move Frazier or Bruce he weakens other positions. We’re not talking about criticizing Walt for not getting Stanton or some other player that would cost the farm. We’re talking about Walt’s inability to get a league average hitting first baseman. Guys like that wouldn’t cost much. Your article really summarizes the Reds season to date well. I had already forgotten about being 8.5 games back on June 20. With the injuries they faced, this team could have folded. On the other hand, if they can stay in it and get back to full strength later in the season, this team could be a terror. With the uncertainty of Votto’s return and his condition when he makes it back, I sure would feel a lot better if Walt came up with another answer for first base. Simon has been spectacular and deserves his inclusion on the All-Star team. As many injuries as the line-up has faced and continues to deal with, a blow to the starting rotation would be a bigger challenge. Huge THANK YOU! to Steve, Nick, Richard, Chris, Chad, Michael, Greg, Tom, Joel (I am sure I am missing some other contributors…!) 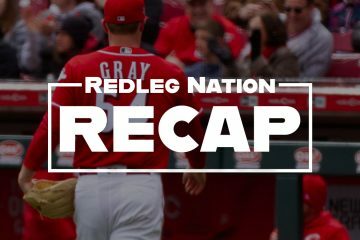 for delivering such awesome daily content on Redleg Nation. It keeps keeps me equal parts informed, educated and entertained, and I don’t know of another sports site which comes anywhere close! Buy a shirt! 😉 In before Steve! Have I mentioned we have kids sizes? Walt J did his best work building the backbone of this team,The pitching staff.Simon was a steal ,Latos was a deal ,A couple of Cuban relievers …..not bad. I also think he picked the right SS and catcher. I like all Reds fans want more,we have some holes (depth) .I think if our “proven” talent was healthy all year we would be a force in NL.The young talent has been better than expected. I am enjoying the Walt J era of winning Reds baseball……….GO REDS! I agree. Walt is doing a fine job, this ‘player”everyone is looking for him to secure May not exist at a reasonable price. If he has no money to work with or even if he does. What do these folks want.? Will they be happy with this “player” at the expense of Winker or Stevenson? The goal as has been stated numerous times is to build an organization that will contend every year. From what I have seen the Reds are just that under their current leadership. Let’s not forget about BHam. If the consensus of Redleg Nation in April/May would have been the rule, he would have started the season in Louisville. Then after that debacle, he would have batted eighth or ninth at the MLB level..
Walt has done an admirable job and I’m guessing if we were privy to all the facts, he would be thought of higher then he is. As mentioned above by VegasTypo, Reds have been very resilient in mode Price stressed he wanted the team to be. Also, defense has been top notch again. However, only so much pixie dust exists for a team and to extend it, it would seem Reds need to make some type of move for a bat, even if its a platoon guy for 1B/Lf or Lutz/Soto start hitting and take on 1B role jointly or with Pena. Hopefully, Reds can figure out how to keep it going. Been a wild season of ups-and-downs already. From Billy Hamilton being dominated by Cards staff, Hoover giving up a game-ending grand slam vs Mets, to Billy Hamilton doing his own dodge turn spin slide bunt single, Chapman blowing away 3 pirates on 100+ mph fastballs. Jumping in… First, I hope we don’t start running this bandwagon is a 100mph. I liked this article because while it is full of optimism, it also has a temperate tone. I’m not allowing myself to get too emotionally invested because I don’t want my heart ripped out and stomped on like it has been the last few years in the postseason. Second, the team has been called resilient for years. And I definitely agree. Resilience and character are the same thing in my book. We like these guys because they’ve got character. It’s hard not to root for that. It’s hard not to be filled so full of optimism that we become emotionally invested. Third, and final thought, I feel the reasons why teams like the Rangers, et al, can’t overcome the difficulties they have is NOT because they lack character. I feel the reason is rather they are a team of mercenaries. Votto, Bruce, Frazier, Mesoraco, Hamilton, Cozart, Heisey Cueto, Bailey, Leake, Chapman, LeCure… these guys came up through the teams system, and ultimately got to the show with the Reds. I’m thinking they probably feel like family. They’ve additionally went out and got (in some cases) declining, but high character guys like Rolen, Gomes, Miller, Cairo, Cabrera, Ludwick, Schumaker and Pena. Likewise they went and got talented pieces like Phillips, Latos, Choo, Arroyo… all of whom has added their DNA into the this club. The team is just built well. Shallow, yes. But it is built very well. I’d add that BP probably feels like he came up in this system, too. Cleveland never gave him a chance and it wasn’t until he got here that an organization invested in him and showed him some love. And he’s blossomed and gotten rich over almost a decade with the club. Agree and it certainly feels like BP came up a Red. Good point. Oops… One more thought. If Frazier goes out and does well in the HR Derby tonight, you can add Frazier to the list of stars on the team. Instead of hearing the names Votto, Bruce, and Phillips it will become Votto, Bruce, Frazier, and Phillips. Yeo, i agree with this. A big chance for Toddy Ballgame to get his name out there in the limelight. Generally, a very good article but your criticism of Walt Jocketty is way over the top. Your own words are “As outsiders, we donÃ¢â‚¬â„¢t know what goes behind the closed doors the locker room” but yet somehow, miraculously, you seem to know everything that goes on behind the closed doors of the GM office. Do you know what budget constraints he has to deal with? Do you know what parameters Bob Castellini has given him to work with? Or, more importantly in my mind, If we trade away top prospects for a temporary fix, are you going to note that the next time (and every time) you complain how barren our minor league depth is? The selection of Bryan Price, by itself, will probably get WJ extended. So for the Walt doubters, you have been warned. If Walt doesn’t do anything at the deadline and they mis the playoffs this year, Walt’s done. If they make the playoffs regardless of what Walt does at the deadline, he’ll be extended. Assuming he wants to be. I think it’s a pretty fair criticism to say Walt has dropped the ball by not having a major-league caliber backup for 1B, especially given the fact that Votto has been somewhat hobbled going on 2 full years now. And don’t say Pena is that guy. They lucked out that Pena seems to be OK defensively there, and his offense has added zero value to the team. Overall, he’s at 0.1 fWAR, which is essentially replacement level. What major league caliber backup would you have suggested Walt went and got and what talent would you have been willing to part with? Answer to your first question; any. If you are insinuating there are no major league caliber backups available, you are wrong. Answer to your second question; not a lot. I’m not talking about a starter, here. I’m talking about a backup. You don’t always have to give up a lot of talent to get guys like that. I read the Articles on Redlegnation all the time, but never comment. However, sometimes I shake my head at some of the things I read here. Walt Jockety’s failure to do his job seems to be a favorite theme. 2 years ago he traded for Latos and it appears that we got the better end of that deal. Some even said that we traded the wrong catcher. We also picked up Simon from the scrap heap. Last year we needed a leadoff hitter and traded a AAA shortstop and center fielder for Sin Su Choo who was what, 2nd in the national league in OBP? This years big decisions were to NOT pursue a replacement for Choo and to allow the unproven Hamilton to have a shot at playing every day. How’s that working out? How’s the decision to trade Hannigan and let Mes be the man working? I even remember reading on this blog that 3rd base was one of the positions that Walt just have looked at upgrading. How’s that non-decision working out? The biggest complaint seems to be having no backups. Nobody has a productive backup at every position. What productive MLB player is going to come to Cincy to backup Votto and BP? Any productive MLB player, given the choice, is not going to team where an all-start player already occupies their position. They’re going to a crappy team with an unproven position player where they think they might get a chance to start. So, no, I do not think it’s possible to have good players to backup every position. That being said, with all the injuries it has been remarkable that the players we do have as backups have performed so well. I’m probably the writer here who has been most critical of Jocketty lately. But I’m not calling for him to be fired or saying he’s a terrible GM or even that his tenure for the Reds overall has been bad. When he’s made moves that I liked, including ones where I was in the minority (Rolen) and ones that didn’t work out (Marshall), I’ve praised and defended him. I wrote a post supporting how he handled the catchers this off-season, ditto with the Choo and Latos trades. Even in this article, I’ve said that he’s come through with trade deadline moves before. But that doesn’t mean he’s been perfect, either. His failure at last year’s trade deadline strongly contributed to the Reds disappointing finish, in my opinion. And his off-season inaction this year was equally deficient. He’s been really lucky that certain players have performed well so far for short periods of time. And I’m glad they have. But I’d rather not continue to rely on Ramon Santiago to play 2B, Skip Schumaker to play LF and Brayan PeÃƒÂ±a to play 1B. I don’t think that lineup will be able to keep up with the other teams in the NL Central who will make moves to improve. I would have to agree with Steve on this one. I’m glad these guys have come through when needed so far however I just don’t see that lasting all season and into the playoffs. They’re journeymen players at best. I hope they continue to play well and make me look bad but it really isn’t realistic. Jocketty has gotten lucky with these guys so far. They’re not game changing talents. He does need to do something. I do believe that just one bat would be enough but Jocketty can’t rely on luck all season long. Steve, I’d have to say the Reds’ disappointing finish last year had more to do with the fact that Dusty Baker lost his clubhouse, than anything Jocketty failed to do. The Jocketty Bashers love to cite the failure to acquire Marlon Byrd, but the moves the Pirates made served only to get them to a play-in game, which they won largely because Latos was hurt and Cueto was rushed back too soon and was under prepared to start that WC game. We agree. Jocketty isn’t perfect. But when you make statements like ” itÃ¢â‚¬â„¢s (past) time for Walt Jocketty to do his job,” you’re not just saying he’s not flawless–you’re intimating he hasn’t been doing his job to begin with. But, Jocketty aside, I loved the sentiments you expressed. Good read. For the past fifteen months I don’t think Jocketty has done an effective job with respect to the Reds roster. Not even close. Richard, last November (2013) when when you wrote “Get that big trade done, Walt. In fact, make it two.” I agreed with that. The Pirates came within an run of beating the Cardinals in the NLDS, so I wouldn’t make too light of their trade deadline moves last year. The Reds paralysis at the trade deadline almost certainly cost them home field advantage in the play-in game. That was no small edge. Certainly plenty of blame to go around, including players, injuries and Baker. Just can’t see giving Jocketty a free pass over doing absolutely nothing all year to make the team better. Unlike every other GM for a post-season team. In professional baseball, home field is not nearly the advantage you are making it out to be. The Reds didn’t lose home field because of Jocketty. They collapsed the last week of the season. That’s on Baker. The GM built a roster that won 90 and 97 games the last 2 years. Incessantly attacking the GM for not making moves when you deem them imperative is a recipe for bad trades. He certainly didn’t make any bad trades like your hero Dombrowski did, giving away Doug Fister for not nearly enough in return. This team has been a winner since Jocketty got here. Despite what others suggest, the farm system has been wildly successful feeding the big league ballclub. And whether you will admit it or not–this team has a budget. You would be better served directing your ire at the owner, when the Reds don’t take on the salary you insist is necessary, or for dumping the money they spent on Ludwick and relegating him to the bench for that new LF with a shiny new price tag you insist Jocketty must get, damn the cost. Because, I’ll bet the owner has had something to say about all of that, too. It ain’t all about Walt. I think most here underestimate what all is involved in the GM position and what it takes to make deals. I doubt any of us could walk in and even have an idea of how to do the job. I agree I would love to see Walt doing “more” but without knowing the position and the boarders that he is working in, it’s really tough to know why he did or didn’t do something. I certainly agree with your assessment Steve – spot on ! Craig, you should comment more often. Great points, all. I have felt like a lone wolf howling in the dark about the job Jocketty has done. Steve and I agree about many things related to the Reds, but the subject of our GM is where we part company. I’d ask anyone who complains about the Reds’ bench to look around the majors and check out the roster of teams spending far more money than the Reds and who they have backing up their starters. Thanks for the common sense, Craig. I’m right in the middle on the Walt opinion spectrum, but I will say that the 1B situation is a pretty clear failure on his part. I don’t think anyone should have suspected Joey would be limping this year – he seemed healthy last year if maybe still regaining a bit of his power – but to go into the season without a bench player who had ever even played the position before? That’s pretty poor management. Soto hadn’t given anyone any reason to believe he would be able to fill the role and Hannahan was getting cut open. Agreed: Good comments by Craig and interesting dialogue between you and Steve. One small point: The team has been a winner since WJ’s arrival, as it was during Baker’s tenure (I know, they overlapped, so chicken and egg, chicken and egg). It also seems unlikely that the current patchwork lineup, exciting as it has been, will continue to keep the pace during the second half, but I do have faith in Price and in the defense and pitching (depending upon injuries, always), and won’t be too quick to fall into morbid despair. Thanks to all for the excellent articles and reactions. A David Foster Wallace quote….Good to see someone appreciates good literature. I’m sure that most that read these comments have watched as much Reds baseball as I have and it’s amazing how our perspectives can be worlds apart. I can remember having a different opening day starting pitcher every single year and I wouldn’t trade one of them for our worst starting pitcher today. I can remember a constant revolving door of journeymen shortstops who wanted to play here because they knew that the Reds had no options and that this was a place that they could be a starting shortstop. I remember players like Johny Gomes and Lance Nix who assumed that Cincy was place for a marginal player to come and win a starting position. Those guys don’t want to come to play here anymore. This is a team with major league caliber players throughout the lineup. There aren’t enough good players in baseball for every team to have a good player at every position. So the marginal players flock to teams where there’s opportunity. Show me the team with best backups in baseball and I’ll show you a team with crappy starters throughout the lineup.Personally if you would have told me 10 years ago that the Reds biggest problem in 2014 would be that the backup infielders weren’t very good, but that their backup starting pitcher made the all-star team, but that the nest backup starter wasn’t promising, I would be pretty happy. And yet, here we are talking about how the GM might need to go. Perspective (imo). Most of the roster improvement for the Reds the past few years is due to the owner spending $112 million instead of half that, wouldn’t you say? I wouldn’t give the GM credit for all of that. Funny you mention Gomes. He played left field. That’s the *starting* position (not backup) that I’ve most complained about Jocketty not filling. And it was Jocketty who brought in Gomes (and Willy Taveras) who you consider marginal players. Jocketty’s inaction last off season has been bailed out by the emergence of Todd Frazier and Devin Mesoraco as right handed bats, neither of which a reasonable forecaster would have called. That’s been Jocketty’s biggest failure – not the bench – his inability to add a right handed bat (which would have helped against Liriano in the play-in game). He’s relied on Ludwick, who is one of those marginal players you mention. Again, Steve, your implication is that Frazier and Mesoraco are flukes. That “no reasonable forecaster would have called” is a ridiculous comment. Despite what it is you think you know, is it not reasonable to assume that WJ knows more than you. Just because you didn’t foresee these two having knock out years does not mean that a GM with 40+ years in baseball couldn’t see it coming. My guess is that WJ has forgotten more about baseball and evaluating talent than you have ever known. I don’t want to speak for Steve, but I don’t think that statement implies their performances are “flukes” at all, only that they have been unexpected. I think everyone thought Mes had a lot of untapped potential. Same goes for Hamilton. But I don’t think anyone expected to see it on display at this level so quickly. Mesoraco is having one of the greatest offensive seasons for a catcher in the HISTORY OF BASEBALL. I don’t care what Walt knew that I didn’t know this winter, he wasn’t predicting that. And as for Frazier, the indicators you would use to try and predict what a player would do were pointing him in the wrong irection. I’m willing to believe that Walt knew better there and that 2013 was simply a bad year for him, but I don’t think he knew we could expect him to be 3rd in the NL in HR’s at the break. He only had 19 HR’s all of last year. None of that is to say anything those guys are doing is a “fluke.” It’s come from diligent work, evolved approach at the plate, growth. And Walt might have been higher on those guys than the general public because of the behind closed doors info he had, but I don’t believe for a second he was predicting this kind of production. Well, I’d call them surprises, not flukes. As for the preseason forecast, if my comment is ridiculous, surely you’ll be able to find one that projected Frazier or Mesoraco’s season. I won’t hold my breath waiting for that. Walt knows more than I do for sure. But he’s also got well-known biases. If you want to defend signing Willie Taveras or trying to trade for Ben Revere, go for it. If you want to defend his level of spending on the bullpen, it’s a free country. I’m surprised you bother to come here for other opinions when you could just read the press releases from the Reds, since they know so much more than the rest of us. For a useless though experiment on the GM debate. Here are the current 2014 WAR values by player, how they were aquired and when. Of the 17 0 or negative WAR guys on the roster, 13 ar4e Jocketty acquisitions. Sorry, nothing ever formats properly on the intertubes. I would imagine that most of the negative WAR guys on any team were acquired by the current GM. Why? Because no team is keeping AAAA players and scrub backup infielders on their roster for that long. I’m sure Krivsky had plenty of negative WAR scrubs and they were probably his own acquisitions. The guys acquired by the previous GMs are all good. That’s why they’ve been around for so long. You could do this analysis for any major league team and I would imagine you would get a similar result. And as for the increase in salary being the sole reason for the teams success, they were a playoff team in 2010 and 2012 prior to the team salary being increased. The salary increase seams like a by-product of 1.) winning and 2.) payroll increases across the league in general. Sure give the owner some credit, but give the GM some credit for putting a winning team on the field in the 1st place. They WERE in the playoffs and we know all about the sample size of those series, right? Good point about the analysis of the numbers and turnover rate on AAAA players. Spot on, I’d say. Given that the core of this team: Bruce, Votto, Cueto, Bailey, Phillips–and supporting players like Frazier and Cozart–were here before Walt Jocketty arrived, it’s no surprise that the WAR numbers favor Krivsky. Krivsky did some terrific work when he was here. Given that Jocketty has been tasked with adding to an already strong foundation, those numbers aren’t surprising. The numbers say Cingrani is a Jocketty mistake compared to Kris Negron. Anybody believe that? Jocketty’s biggest trade (Latos) barely rates half the value of Krivsky’s acquisition of Cozart? Using WAR blames a GM for injuries, which, the last time I looked, are kind of hard to foresee. And of course, some of these players that appear on the negative side of Jocketty’s ledger may very well turn out to be pleasant surprises going forward. Like Tucker Barnhart or Sam LeCure or JJ Hoover. Not to mention Cingrani. I’ve been chewing on this for a while……Did Dusty do Frazier/Mez a favor by slow playing them or if 2014 is justification for the Baker firing. I was very frustrated with the lack of Mez’s playing time last year (plus not being on playoff roster in 2012), especially given Hanigan’s “offensive” numbers. (So, while there is no way I expected Mez to be an All Star this soon, it was obvious that he warranted more playing time.) Same with Frazier the year before. So, when I hear Price getting bashed I just shake my head. And, Walt to a lesser degree. After all, he didn’t re-sign Rolen and traded Hanigan, “forcing” the manager to play the younger/better players. It seems to me the vast majority of his moves (or non-moves) have been beneficial to the Reds. At least in Frazier’s case, the issue isn’t playing time (Baker) it’s more hitting approach (Jacoby and Baker). The two keys to Frazier’s success this year are laying off the outside breaking ball and shortening his swing. Until this year, he’d continued to use his long, loopy swing from his little league days. This year, he’s shortened it which means he can wait longer before committing to swing which helps him lay off the breaking balls and he’s hitting way better to the opposite field with power. Which makes perfect sense for a guy like Frazier, who has plenty of power without having to use such a long swing… I had a long swing because it was the only way I’d hit one out. Frazier is so strong that a compact, direct to the ball, swing still allows him to crush a baseball. And makes him a .300 hitter if he is consistent with it. If Heisey, Cozart & Bruce could take this approach, wow. TF has not realized his ceiling yet and I hope he will get there. If you get a chance, LW take a look at Heisey’s Spray Chart. Not excusable for a non-power guy. I’m convinced this guy has what a takes to be at minimum an “average” MLB bat. Yeah, I saw his spray-chart a while ago. He pulls everything. Did you see how far the Pirate’s had him shifted in the outfield? Usually you shade one way or the other in the outfield if anything but this was an outright shift. It cost him a base as he ripped a ball down the LF line and only got a single because the LF was playing right near the line. Maybe two or three line drives to center and right fields. If they could help him get straightened out, he could be the LFer we have been looking for. The rest of his game is top notch: fielding and base running. You couldn’t ask for a better attitude. IMO, he maybe a victim of DB’s approach: swing often and swing hard. And that leads to long-term success rather than the short-term success Frazier achieved in his rookie season. Steve, great post. But I strongly disagree about Jocketty. If your point is “I hope he’s able to bring in someone who can really pick up the slack for the injured Votto and Phillips without completely mortgaging the future, and if so I’ll say he’s done his job”, then I think your standards are simply too high. But my real disagreement is with the part about his offseason of inaction. To begin with, a lot of the guys that have been carrying the team in the absence of Votto and Phillips, such as Santiago and Schumaker, were acquired this offseason. (Schumaker was decent Hamilton flame out insurance, wasn’t he?) They’re backups. I’m sure Walt doesn’t want to have to rely on them for the rest of the season, either, but he–and we–should be glad they’re around. Secondly, trading Hanigan to open up the job for Mesoraco was a big move even if it wasn’t on the order of the Latos trade. Thirdly, they prepared well in the offseason for Latos’s absence, stretching out Simon and bringing in credible backups even though Latos wasn’t expected to miss as much time as they did. Honestly, the roster was well constructed. The bench should have been PeÃƒÂ±a, Schumaker, Heisey, Santiago. Not bad, and 3 of them acquired in the do-nothing offseason, which also included the important non-moves to sign Choo and Arroyo. A moment on PeÃƒÂ±a, also apparently left under Walt’s pillow as he slept through the offseason by the Free Agent Fairy. He’s been a capable defensive catcher. He helped carry the club offensively when Mesoraco was out. His willingness to throw himself into the 1B job was the kind of thing that gets noticed by teammates. (Some might even call it gritty.) He’s done a better job there than the more athletically gifted Jay Bruce. But for me, the most impressive moment was this: a couple of weeks ago he caught Latos for the first time, and Latos pitched a great game. Afterwards, PeÃƒÂ±a went out of his way to publicly praise Mesoraco for helping him prepare, and basically gave Mes credit for the result. A small thing, sure, but a big thing, as well. I guess Walt could have signed a guy like Pierzynski instead, if only he were doing his job. The biggest need in the offseason was RH hitting – not the bench. Everyone seems to forget that, now that Devin Mesoraco is hitting better than Johnny Bench and Todd Frazier is Mike Schmidt. The Reds needed a RH bat, presumably in left field, or possibly center field. Remember Liriano dominating the Reds LH hitters in the play-in game? The Reds offense was bad last year and we lost our second most productive offensive player. Jocketty needed to address that. And he didn’t do anything. How would Jocketty’s off-season look right now if Mesoraco’s OPS was .649 instead of .984 and Frazier’s was .721 instead of .853? Ignoring that central failure because of the surprising way those two hitters have performed is rank revisionism. Jocketty also took a huge gamble on planning to start an unproven rookie in centerfield and lead-off – one who had struggled in an entire season of AAA. Maybe it was a deliberate gamble. Maybe he tried (and failed) to get a different CF, like Grady Sizemore. Billy Hamilton has been OK so far, but there’s no way anyone other than the Billiebers could have expected him to have five home runs by now, for example. And let’s not get all gauzy about Ramon Santiago. On July 6 (this July 6, seven games ago) he was hitting .186/.262/.203, which was substantially in line with the 430+ at bats he’d had for the Tigers the past two seasons. His last week have been miraculous, and that defines the entire length of time this season that I’ve been glad to have him around. You make excellent points, Steve, as you usually do, and I hope that WJ is able to find another RH bat, but not at any price. The Reds have indeed been lucky concerning the emergence of Mes and Hamilton and the great uptick of Frazier, but teams are rarely, if ever, successful without some of that kind of luck, and that luck has certainly been counterbalanced this year by the unending injury plague. As unexpected as Mes, BH and Todd have been is the lack of production from Joey and Jay and, mostly, Homer (who, in fairness, is counterbalanced by Simon). Sure, if Mesoraco and Frazier and Hamilton were doing poorly, I might feel differently. Then again, if they were doing poorly but Votto and Bruce and Latos and the back end of the bullpen had been healthy all season I might be feeling better. The crisis we face now–down both Votto and Phillips–is not something any Cincinnati GM could have prepared for this offseason, and wouldn’t have been solved with getting even more production out of LF. I hope Jocketty is able to come up with something to solve this new problem, but not at the expense of our future. I believe our starting pitching and defense and Frazier and Mesoraco and Hamilton and Bruce and Broxton and Chapman will keep us afloat, and hope we don’t need too much from the Santiagos and Schumakers of the world to win games until Votto and Phillips are back. I’d love to add a high OPS first baseman who costs us very little; I’ll settle for a solid LH reliever and a staff who makes the right call on whether Jumbo can be an effective RH reliever or if we need one of those, too. Don Long was in the Arizona organization when Bryan Price was. There’s nothing to indicate Jocketty had anything to do with that hiring other than signing off on Price’s pick. I gave credit to Jocketty for the catcher move of Hanigan to Mesoraco, although I was more excited about the pick up of PeÃƒÂ±a when I thought that meant easing Chapman into a starter’s role. Jocketty gave Hanigan away. Wins and losses for pitchers? Nice. Liriano had a couple really great games against the Reds last year, without getting wins. What Jocketty was supposed to do was sign or trade for a major league outfielder who could play left and maybe first base (so we’d have a second first baseman on the team) and hit. You know, fill holes like a bunch of other GMs did. It’s incredible how easily we buy into the spin that any move would necessarily be either too expensive or mortgage the future. Those are fantastic post facto rationalizations when your plans fall through. Jocketty has still never given a coherent answer on the Marlon Byrd fiasco last summer. OK, we’re just not going to agree on this. Even if all Jocketty did on Long was agree with Price, that should count for something–even Dusty didn’t get to choose his own pitching coach. Yes, Liriano pitched some good games against the Reds. The Reds also beat a lot of very good LH starters, including Kershaw in September. He did sign a major league outfielder; some guy named Schumaker. Not a great hitter, but who did you want? Maybe Byrd? Is it possible that the Reds organization doesn’t want potential PED issues, and that Jocketty’s failure to explain the Byrd “fiasco” is because he can’t come out and say that? I know PEDs is one of the few major baseball areas where we seem to disagree, but I for one am glad Byrd (and Cruz) aren’t Reds. I’d go so far as to say there was no reason to assume a clean Byrd would outhit a healthy Ludwick this year. It seems Jocketty’s plans didn’t fall through; you just seem to be critical because you didn’t believe his plan to get more RH pop from within would actually work.